Quilling is a very interesting and quick technique. So, I made these lovely quilled paper roses. These are lovely for using with anything. make cards , miniature bouquets. I tried to click the pictures of the steps. Didn't quite succeed . I guess the picture below would help. 1.Start rolling the strip , roll for 1 or 2 times. 4.Then again fold like in step 2. 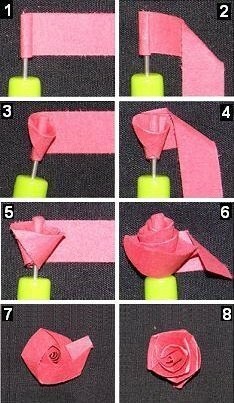 8.Stick the middle center of the rose. Would love to know what you do with these !! these are very easy but look a bit difficult.